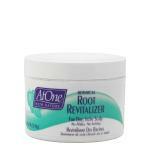 AtOne with Nature Botanical Root Revitalizer For Dry, Itchy Scalp, no flakes, no itching, gives quick relief from itching and flaking with an infusion of high quality oils and conditioners. Clinically proven ingredients immediately help replenish your natural moisture balance and relieve itching and flaking associated with dry scalp and dandruff conditions. Directions: 1. Part hair into sections and apply a dime size amount sparingly. 2. Massage into scalp to invigorate and insure absorption. 3. Apply to scalp at least twice a week. Use daily for maximum results or until flaking and itching has stopped.